SALEM, N.Y. - (Sept 13, 2007) — The National Elevator Industry, Inc. (NEII) today announced a new Web site - www.pbc-elevators.com - dedicated to the promotion and adoption of Performance Based Safety Code for Elevators and Escalators, ASME A17.7/ CSA B44.7 (PBC) throughout the U.S. and Canada. Developed jointly by the American Society of Mechanical Engineers (ASME) and the Canadian Standards Association (CSA), the PBC provides a more efficient, standardized method for specifying safety requirements for new elevator technologies. The PBC is considered an important addition to the 2007 version of the Safety Code for Elevators and Escalators - ASME A17.1/CSA B44 - which serves as the basis for the design, construction, installation, operation, testing, inspection, maintenance, alteration, and repair of elevators and escalators in the U.S. and Canada. "As states, provinces and local governments in Canada and the U.S. work toward adoption of the PBC as part of the adoption of the latest Safety Code for Elevators and Escalators, we believe the new Web site will help interested parties understand the economic, technological, business, consumer and governmental benefits," said Edward Donoghue, Administrator of NEII. "Without PBC, the prescriptive nature of the existing Elevator Safety Code will continue to make it difficult for architects and builders to specify and install advanced elevators that are safer, faster, quieter, more efficient and more accessible." The need for PBC arises from the prescriptive language in ASME A17.1/CSA B44, which addresses technology that has already been introduced without providing a uniform, structured approach for introducing and approving new technology. This has led to a hodgepodge of different processes in jurisdictions throughout Canada and the U.S., including some localities that do not have procedures to allow for the use of new elevator technologies. One result of regulatory design limitations is that North America is far behind Europe, Asia and other regions that are readily incorporating advanced elevator designs and technologies to keep pace with advanced buildings that are taller, more efficient, sustainable and more resistant to natural forces, such as hurricanes and earthquakes. In fact, the European Union's Lifts Directive 95/16/EC, adopted in 1995, was studied closely by ASME and CSA as they drafted the PBC. Like the Lifts Directive, the PBC incorporates conformity assessment procedures covering the design, manufacture, assembly, installation, inspection and testing of elevators safety components, including review and certification by Accredited Elevator/Escalator Certifying Organizations (AECOs). The Web site can be accessed directly at www.pbc-elevators.com or through the NEII Web site at www.neii.org/pbcmain.html and explains in detail the need for ASME A17.7/ CSA B44.7 as a Code companion to the 2007 version of ASME A17.1/CSA B44. Major portals on the Web site include FAQs, Press Room, Benefits, Why PBC, About the PBC, and links to supporting organizations, including: ASME, CSA, NEII, the American Institute of Architects (AIA), the Building Owners and Managers Association International (BOMA), the National Association of Elevator Contractors (NAEC) and the National Association of Elevator Safety Authorities International (NAESAI). There is also a link for visitors who want to read the proposed PBC itself and a section that will track jurisdictions as they adopt the PBC standard. 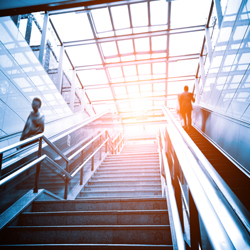 "The demand for elevators that are faster, quieter, more efficient, and more accessible must be met with new designs and cutting-edge technology," said Donoghue. "With more than 100,000 new elevators or major retrofits in the U.S. and Canada every year, it is important that jurisdictions adopt the PBC's uniform method for addressing the safety of new technology. The PBC will allow the United States and Canada to keep up with emerging elevator technology while maintaining or exceeding the safety and performance requirements in the current code." The National Elevator Industry, Inc., is a national trade association representing the interests of corporations, firms or companies that, as part of their regular business, provide or perform any of the following: manufacture (including parts or components used by others in the manufacture, repair or maintenance), install, repair and maintain elevators, escalators, moving walks and related equipment. Trust membership is available to those corporations, firms, or companies who, as part of their regular business, employ members of the International Union of Elevator Constructors (IUEC) and contribute to the benefit trusts (Trusts) established by agreements between the IUEC and NEII. NEII strives to become the leader in promoting safe building transportation, as well as working with local government agencies to encourage the adoption and enforcement of the latest codes and standards.